Because of family health problems that require my attention, I will be suspending further posts for a time. I appreciate all the visitors I’ve received and the comments made. I’ve had the pleasure of sharing my thoughts with many people from different countries and I value this experience. I’ve also visited many other blogs, which have provided me with entertainment and material for reflection. I hope to contribute new posts as soon as I am able. I plan to restructure the main page, making subjects easier to locate. I’d like to offer inner tubing videos and I have other plans as well. My computer knowledge is rather limited, so I will require assistance with the aforementioned tasks. of what’ll allow them to live their dream. and ask for a pint of cream. 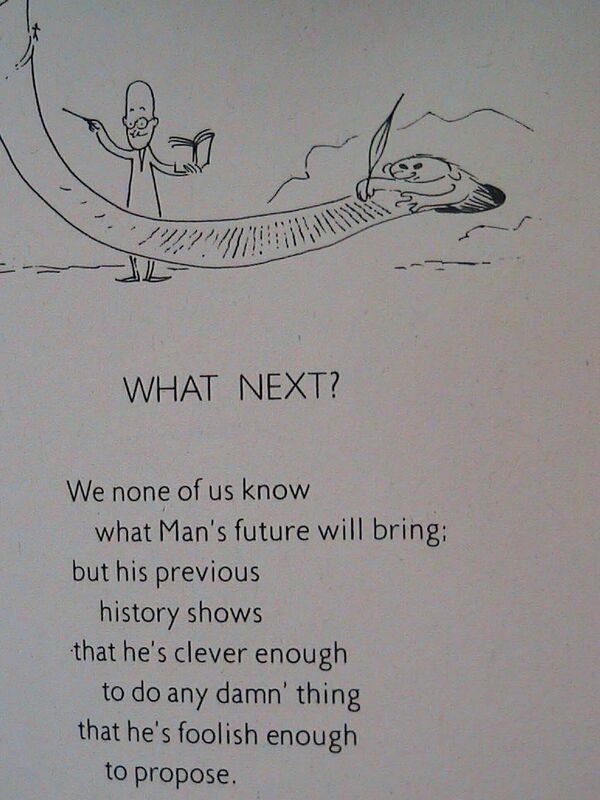 The Special World Of Piet Hein, Part 2. Just like Hein’s other poems, the Grooks are written in a classical metrical, rhymed form, and they have fortunately withstood the tinge of rhetorical pathos that occasionally hovers over certain popular poetry and hymns. The Grooks are at the same time crafted with precision and free flowing. Their paradoxical and fertile wisdom is often expressed in the very last word, like a pointed revelation. It is neither satire nor sarcasm, but humor alone that lifts and carries these thousands of fairy-like declarations of independence. Quite often their humor and catharsis are brought together through a play on words or an allusion, but it is always through perspective. The Kumbel figure, which has found form in both the poetry and in Hein’s own drawings(with an affinity to Axel Nygaard’s vignettes), and which have had a vital importance for the poetry’s longevity, is a spiritual vagabond, a free spirit, a kind of cousin to Chaplin(with whom Hein became friends.) With a flight of fancy, and without any sticky moral arrogance, Hein moves from the infinitely small to the infinitely large, from the restrictive to the cheerfully expansive. He is a reformer who paves the way for a bloodless revolution and is full of confidence in the future. His aphoristic mini poems systematically oppose political systems and have enough ideas to puncture ideologies. The monumental number of quotations from Hein’s Grooks that have found their way into newspapers, books, lectures, and even on ashtrays and other similar industrial objects bear witness to a popular propagation that is presumably greater than that of any other contemporary Danish poet. Hein has translated personally many of the Grooks into English, German, French, and Esperanto. Their status as classics has been assured, but perhaps their apparent weightlessness has resulted in their not always being considered to be among the heavyweights of domestic literary genres. if we cultivate knowledge as such. when Ignorants know too much. The Special World Of Piet Hein, Part 1. Martin Gardner, Scientific American–Piet Hein has one of those rare and psychologically mysterious minds, possessed by so many great creative scientists such as Einstein and Niels Bohr, a mind that goes straight to the heart of a problem, seeing all its aspects as a single unity, then finding a solution that is as unexpected as it is beautiful. we are taught to feel. The Dane Piet Hein was the inventor of the super ellipse. a respected mathematician, an activist in the Danish underground and the creator of grooks. Grooks are aphoristic verses accompanied by a light-hearted and often humorous drawing. Grooks often have several levels of meaning with philosophical overtones. They have been declared in public places, set to music, and quoted extensively in Danish papers. Piet Hein was enormously popular in the U.S. in the 1970s, but has since faded from view. His Grooks, which were once commonplaces on University bookshelves, are more difficult to obtain. Piet Hein himself translated his seven volumes of Grooks into English with the assistance of Jens Arup. However, out of about 10,000 grooks, somewhat less than 400 have been translated into English. What a colossal loss for English readers as the following article will show. Nils Aas wrote one of the few articles about Piet Hein, concentrating exclusively on grooks. Roger Stevenson, Professor of Modern Languages at Southern Oregon University, provided the translation of this brief, but highly informative article. The * parenthetical comments are mine. The most widely known of his output, the upwards of 10,000 grooks, is a specialty for which one can easily find literary influences(Christian Morgenstern, for example), but which are, nevertheless, completely his own. The word “grook” is an invention of Hein’s(with the possible inspiration of the partridge, according to Johannes V. Jensen), and it has its own grammatical rules. Throughout more than forty years, and through an eventual universal diffusion, the grooks have shown to be able to withstand even the most persistent repetition. The grooks are a separate art form that are completely original, and which can be compared to Hans Christian Andersen’s fairy tales, Johannes V. Jensen’s myths(* He wrote The Long Journey in which he attempted to rewrite the Genesis myth from a Darwinian perspective.) and Storm Peterson’s flies( *He was a Danish cartoonist, and his “Daily Flies” were drawings accompanied by philosophical sayings.) Like everything that Hein produced, they are art forms in every way. In various newspapers and journals of the 1930s, among others in Politiken’s “Day to Day” column, Hein had published several short poems, which later found their way into the collection of Grooks. After the 9th of April 1940(the day Denmark was overrun and occupied by the German army), the Grooks appeared regularly in Politiken where, just like Poul Henningsen’s Musical Review songs(*Henningsen was an author, architect, and polemicist, who published a diatribe about Danish culture. ), they were able to ridicule the occupation power: “The cultural community depends on the power of understanding”(from Piet Hein’s poem, The Tenth Muse, Christmas, 1941.) The Grooks appeared originally with the name Kumbel Kumbell in Politiken’s daily nonsense column”Just Think”. Moreover, Hein furnished this column with aphoristic material under the name Notorius Jubelco. These were eventually published under the title Word in 1949. As these poems grew more and more popular with the time, Hein used the pseudonym Kumbel, which served as his alter-ego in the years to follow. Eventually, Hein would even use his own name for the poems that were formally written by Kumbel. The Dutch name Piet Hein helped perpetuate this pseudonym: Piet can be translated as either stone or rock. Hein translates as a whetstone, and, together with Kumbel, the meaning becomes a stone with an inscription, a memorial stone. The poems should be able to withstand the ravages of time and be their own monument.